Professor Hossam Haick, an Israeli Christian, delivered Technion UK’s Ron Arad lecture at the Royal College of Physicians last week. The electronic ‘nose’ he developed can smell 17 diseases on a person’s breath, including Alzheimer’s, Parkinson’s, tuberculous, diabetes and lung cancer. The non-intrusive medical device, which works by identifying as disease’s bio-markers, has attracted the attention of billionaires such as Bill and Melinda Gates, whose foundation focuses on the diagnostics of diseases. The University said the latest advances in his research mean that it has the potential to identify diseases though sensors in mobile phones and wearable technology, and with more analysis and data it may even be able to predict cancer in the future. San Diego based Grolltex was granted a patent by the USPTO for a new multi-modal ‘super’ sensor design made of single layer graphene. The patent, titled “Graphene-based multi-modal sensor” describes a one atom thick architecture and utilizes several of Grolltex’ 2D materials technologies to produce what the company internally calls ‘The smallest, most sensitive sensor in the world’. The company is working on initial applications for these sensors that are targeting the bio-sensing and defense fields as leading-edge users of this technology. “Our single atom thick sensor design, in the strain sensor configuration, is so sensitive that it captures a robust and repeatable signal on the contractility strength of individual ‘cardio myocytes’ or heart cells as they beat”, said Jeff Draa, company co-founder and CEO. “This can be a holy grail for fields such as cardiotoxicity testing as it has the capacity to be a significant time and money saver in the new drug testing and approval process”. Additionally, the single layer graphene sensor covered by this patent has a very high threshold for thermal coefficient of resistance, meaning it experiences little to no signal drift when exposed to extreme levels of heat. This makes it an ideal sensor for measuring micro strain in high speed aeronautical vehicles. These sensors are so small and thin, they can be layered into the skins of airplanes, helicopters or other high stress vehicles to real-time measure and detect micro stress at architectures and levels not currently possible with today’s sensing technologies. These sensors could also be discreetly placed within critical structures such as bridges or buildings. University of Cambridge and IBM Collaborate on “Something Deep Within” ~ Nanocrystals grown in nanowires for new classes of high-performance, energy-efficient computing, communications, and environmental and medical sensing systems. Top: High-resolution electron microscopy images of a nickel silicide rhombic nanocrystal embedded in a silicon nanowire prepared with gold silicide used as a catalyst. The images demonstrate the intimate interactions that arise at the interfaces of these nanomaterials. Bottom: The physical properties that arise from such complex nano-systems could be used in next-generation photodetectors, lasers, and transistors. As any good carpenter knows, it’s often easier to get what you want if you build it yourself. An international team using resources at the Center for Functional Nanomaterials took that idea to heart. They wanted to tailor extremely small wires that carry light and electrons. They devised an approach that lets them tailor the wires through exquisite control over the structures at the nanoscale. New structures could open up a potential path to a wide range of smaller, lighter, or more efficient devices. This development could lead to highly tailored nanowires for new classes of high-performance, energy-efficient computing, communications, and environmental and medical sensing systems. The resulting devices could lead to smaller electronics as well as improving solar panels, photodetectors, and semiconductor lasers. Semiconducting nanowires have a wide range of existing and potential applications in optoelectronic materials, from single-electron transistors and tunnel diodes, to light-emitting semiconducting nanowires to energy-harvesting devices. An international collaboration led by the University of Cambridge and IBM has demonstrated a new method to create novel nanowires that contain nanocrystals embedded within them. They accomplished this by modifying the classic “vapor-liquid-solid” crystal growth method, wherein a liquid-phase catalyst decomposes an incoming gas-phase source and mediates the deposition of the solid, growing nanowire. In this work, a bimetallic catalyst is used. The team showed that by appropriate thermal treatment, it is possible to crystallize a solid silicide structure within the liquid catalyst, and then attach the nanowire to the solid silicon in a controlled epitaxial fashion. The Center for Functional Nanomaterials’ Electron Microscopy Facility was employed to image the nanomaterials by high spatial-resolution, aberration-corrected transmission electron microscopy. As well, scientists used a first-of-its-kind direct electron detector to obtain high temporal-resolution images of the fabrication process. Incorporating these instruments with the expertise and insight of the scientific team led to fantastic, nanoscale control over these structures and presents notable potential for a broad range of potential devices, like photodetectors and single electron transistors. The above post is reprinted from materials provided byDepartment of Energy, Office of Science. Note: Content may be edited for style and length. 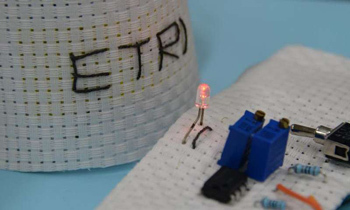 Scientists in Korea have developed wearable, graphene-coated fabrics that can detect dangerous gases present in the air, alerting the wearer by turning on a light-emitting diode (LED) light. The researchers, from the Electronics and Telecommunications Research Institute and Konkuk Univ. in the Republic of Korea, coated cotton and polyester yarn with a nanoglue called bovine serum albumin (BSA). The yarns were then wrapped in graphene oxide sheets. Graphene is an incredibly strong one-atom-thick layer of carbon, and is known for its excellent conductive properties of heat and electricity. The graphene sheets stuck very well to the nanoglue—so much so that further testing showed the fabrics retained their electrical conducting properties after 1,000 consecutive cycles of bending and straightening and ten washing tests with various chemical detergents. Finally, the graphene oxide yarns were exposed to a chemical reduction process, which involves the gaining of electrons. The reduced-graphene-oxide-coated materials were found to be particularly sensitive to detecting nitrogen dioxide, a pollutant gas commonly found in vehicle exhaust that also results from fossil fuel combustion. Prolonged exposure to nitrogen dioxide can be dangerous to human health, causing many respiratory-related illnesses. Exposure of these specially treated fabrics to nitrogen dioxide led to a change in the electrical resistance of the reduced graphene oxide. The fabrics were so sensitive that 30 mins of exposure to 0.25 ppm of nitrogen dioxide (just under five times above the acceptable standard set by the U.S. Environmental Protection Agency) elicited a response. The fabrics were three times as sensitive to nitrogen dioxide in air compared to another reduced graphene oxide sensor previously prepared on a flat material. The new technology, according to the researchers, can be immediately adopted in related industries because the coating process is a simple one, making it suitable for mass production. It would allow outdoor wearers to receive relevant information about air quality. The materials could also be incorporated with air-purifying filters to act as “smart filters” that can both detect and filter harmful gas from air. “This sensor can bring a significant change to our daily life since it was developed with flexible and widely used fibers, unlike the gas sensors invariably developed with the existing solid substrates,” says Dr. Hyung-Kun Lee, who led this research initiative. The study was published online in Scientific Reports.